I was directed to Derek Sivers’ article about seeking inspiration this morning. It’s about taking in inspiration, and the fact that we’re taking in inspiration everyday. He likens it to breathing in. But we can’t just breathe in to survive. 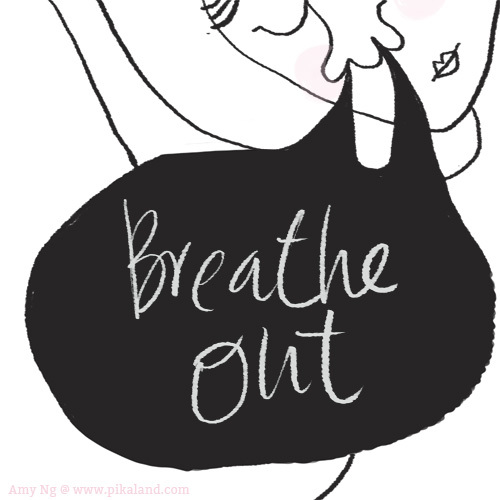 We need to breathe out – and the act of breathing out means that we have to process that breath we just took in, and put it back out in the world. We can’t hoard inspiration and hope that it will enrich us. The fact that we should be utilizing what we were inspired by and to put it back out in the world, now that’s where things can get really interesting. We open up just a little bit more of our hearts when we create. We allow ourselves to get hurt when we invite others to see what we’ve been shielding for so long. To be able bring out our fears and dreams and hope; we have to allow ourselves to feel pain, to heal, and we grow stronger as a result. And that’s what art is – no matter if you’re producing a painting, an illustration, a new book, or a new community. Perhaps that’s why I have greatly reduced the amount of blogs on my reading list. It’s not because they weren’t living up their end of the bargain of providing me with inspiration, but I felt that my well was already full. And it was time for me to make something of the things that I’ve already breathed in, before I’m allowed to breathe in some more. I’ve been holding it in for too long a time. Have a brilliant Monday folks! This is just what I´ve been thinking lately but wasn´t able to put it in words! I definitely need to exhale more. This post pretty much sums up what I´ve been thinking lately. I read very few blogs these days and it’s not, just like you say, because the others are bad, it’s just that I’m feeling kind of full. I need some kind of break to get hungry again.